Every product or service is made for its customers. It's created to either solve their problems or fulfill their needs. Your product or service revolves around your customers and their experiences, and every single day, you're making significant efforts to provide them with a positive experience. This journey of providing your customers with a positive experience starts from the moment they land on your website and extends beyond the moment they become your customer. Although it's a never-ending commitment, encouraging them to become a loyal customer by retaining them is definitely considered a milestone of growth. As Derek Sivers from CD Baby puts it, "Customer service is the new marketing." And that couldn't be truer. Your customers' opinions and feedback are one of the most essential components for the sustainability and growth of your business and are considered important throughout the customer lifecycle. So, why don't we involve them enough? Because we don't know how to. How do you know if the customer is satisfied? Or dissatisfied? How do you decide to work on a new feature, if you don't even know whether the customer needs it or not? What do you think your customers expect from you? Did they find what they're looking for? A customer's experience and feedback should be the only factors that validate important decisions within your business. In this post, we'll dig into customer satisfaction survey questions and real survey examples -- as well as what makes them so impactful. If you want to obtain valuable feedback from your customers then you have to be asking them the right questions. Sharing information isn't always an easy task, and it's not the customer's job to provide your business with constructive criticism. Instead, it's the surveyor's responsibility to create a thought-provoking prompt that engages the participant. Does the product help you achieve your goals? What is your favorite tool or portion of the product or service? If applicable, what gender do you identify as? What is your marital status and do you have children? When asking these types of questions, be sure to embrace a proactive and inclusive approach. These questions shouldn't be mandatory, so always provide an option for customer's to omit an answer. Your goal is to extract honest information, but you don't want it to come at the expense of the customer's comfort. A scale measuring from 1 to 10 (or another number). 1 is an extremely unsatisfied opinion and 10 meaning the customer was very satisfied. A descriptive scale that measures a customer's response from unsatisfied to satisfied. The customer is a given a short list of responses to choose from that range from "very unsatisfied" to "very satisfied." A picture scale that uses images to symbolize customer satisfaction. 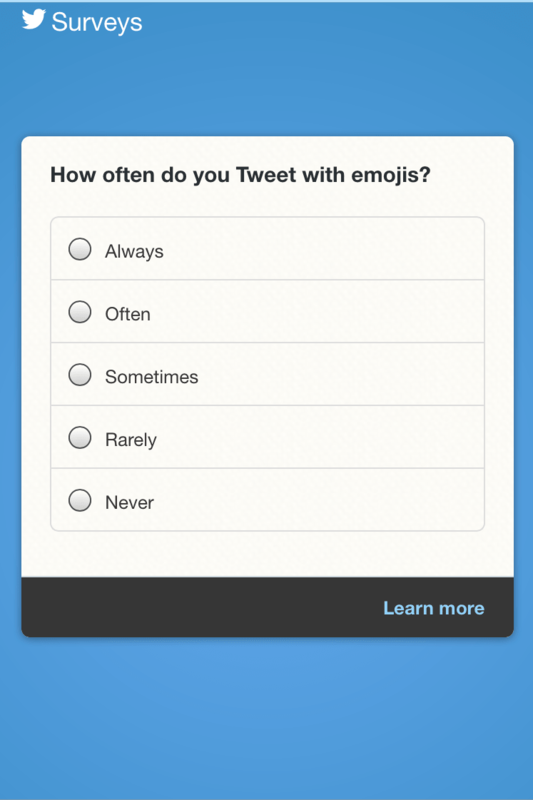 For example, you can use happy, sad, and indifferent emojis to quickly communicate customer feedback. In your own words, describe how you feel about (insert company name or product here). How can we improve your experience with the company? What's working for you and why? What can our employees do better? Do you have any additional comments or feedback for us? May we contact you to follow up on these responses? In the future, would you be willing to take this survey again? If we were to update (insert product feature here), could we reach back out to talk about these changes? While measuring customer satisfaction can be tricky to manage, asking effective questions can reveal highly valuable customer insights. 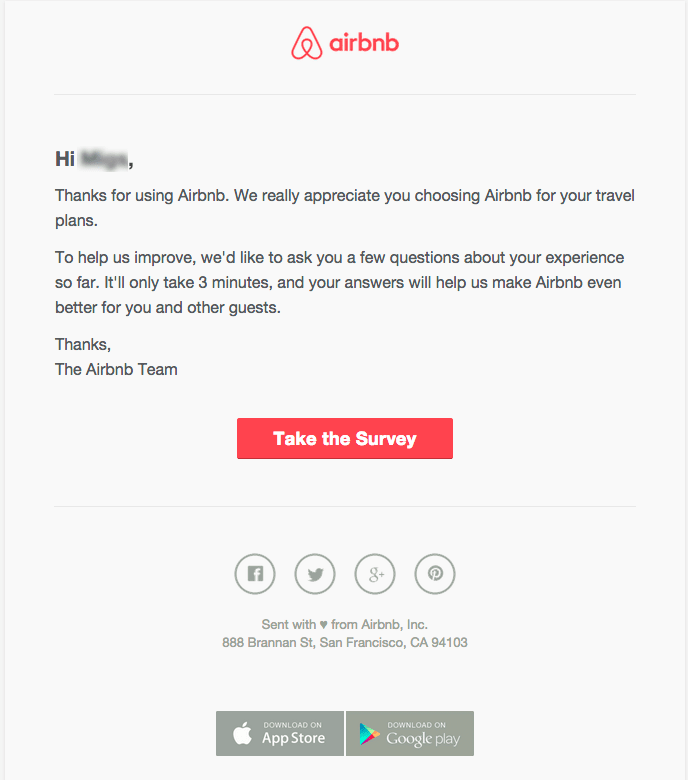 If you're still in need of some inspiration for your customer satisfaction survey, take a look at these examples we pulled from different companies. 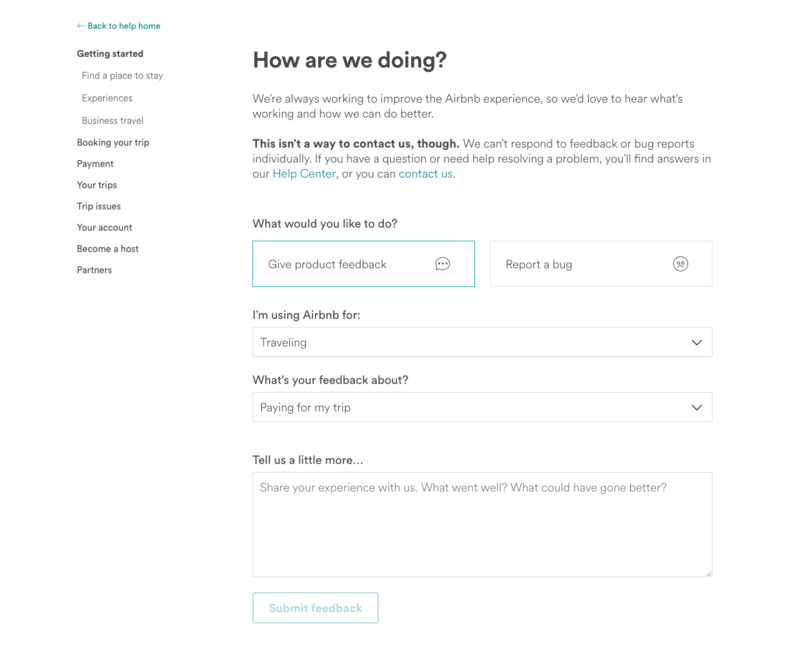 Airbnb politely asks for customers' opinions after their stay, giving them the space to decide whether they want to share their feedback or not. In fact, Airbnb has increased the number of bookings by 25%, just with their referral program alone. What's the point of doing a survey if nothing comes out of it? 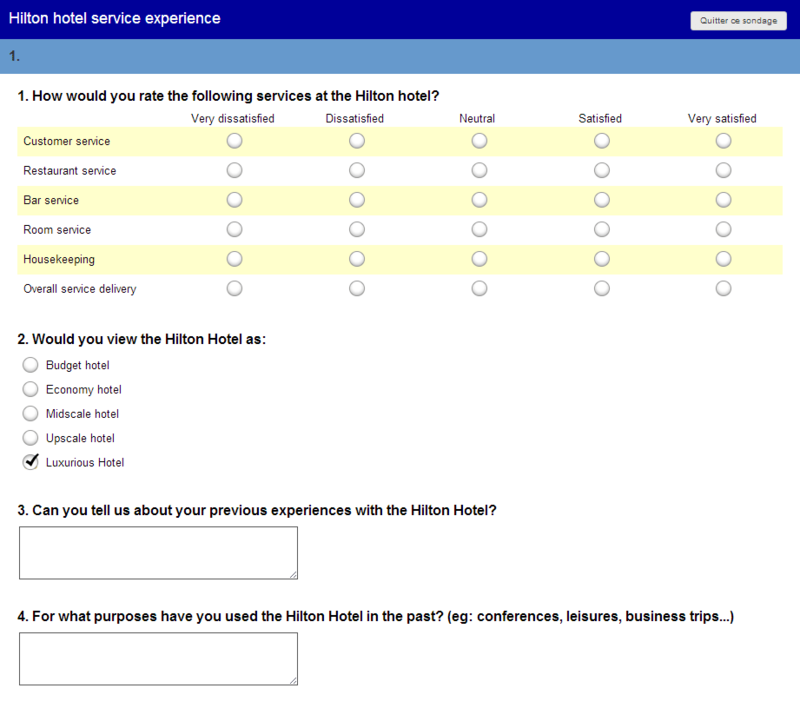 Hilton Hotels seem to be exemplary in following up after every survey. It's called the Hilton Surveying Program. Every survey is looked into regularly, and live data is updated every night. Their response rate is now 30% for online surveys, and the abandonment rate fell by 6% in a year. Uber has two customers -- the drivers and the passengers -- and it does a great job collecting opinions and reviews from both. The passengers give ratings after every ride, and the drivers rate the passengers as well. 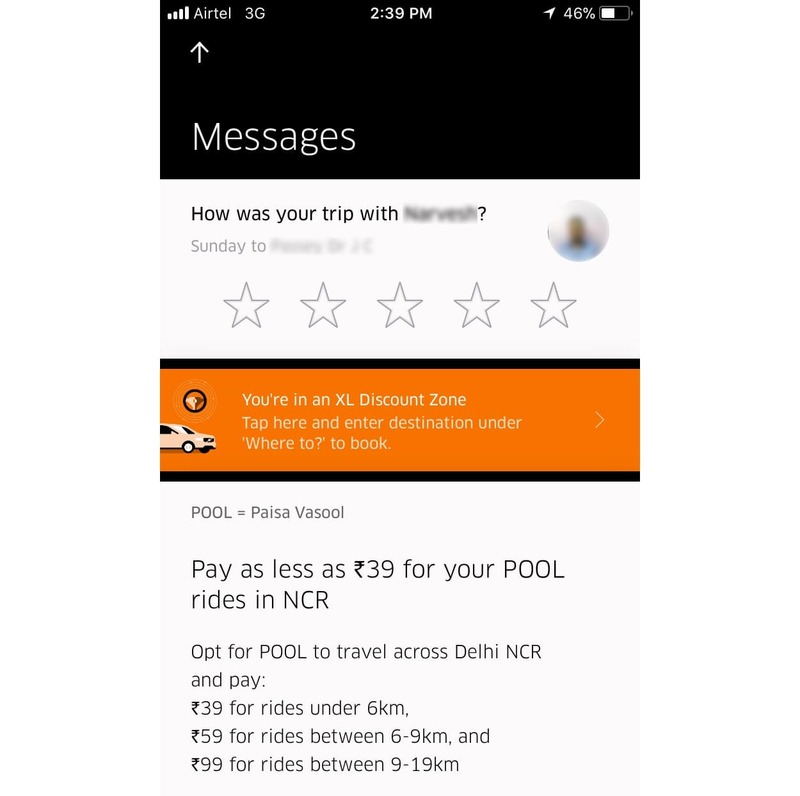 This makes it fair and transparent for both kinds of "customers," and these ratings affect the drivers' and passengers' reputation as well. If a passenger has a lower rating, the driver has the authority to decline the booking. Netflix brings out its A-game when it comes to customer experience. With its recommendation system, it is as customer-friendly as one can get. It studies the behavior of all of its customers and recommends them movies/shows per their ratings, likes/dislikes, or just what they have been watching. 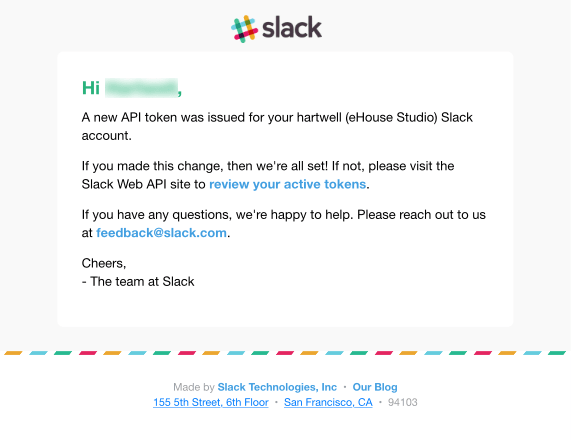 For Slack, customer feedback is at the epicenter of its efforts. The company based its product development entirely on the customer feedback. In fact, there's a command within the application where users can send them feedback, or just tell them what features the users would like to have. The co-founders read all the user feedback and made sure they responded to every ticket raised. Drift sends Net Promoter Score®, or NPS, surveys. NPS is a critical SaaS metric and a method to measure customer satisfaction. The only question it asks is whether the customer is likely to recommend Drift to a friend or colleague. Paytm has always taken customer opinions into account and has taken serious steps to improve customer experience. Taking customer experience and security to another level, Paytm recently removed 85,000 sellers from the Paytm mall and put in some strict steps to verify the quality of existing sellers. 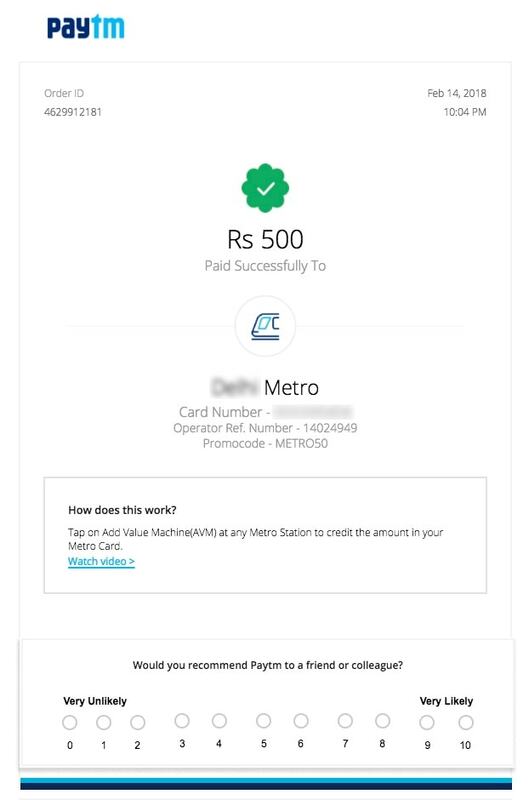 To help its customers who book movie tickets by using the Paytm platform, it allowed them to get refunds on their bookings if they were fraudulent. 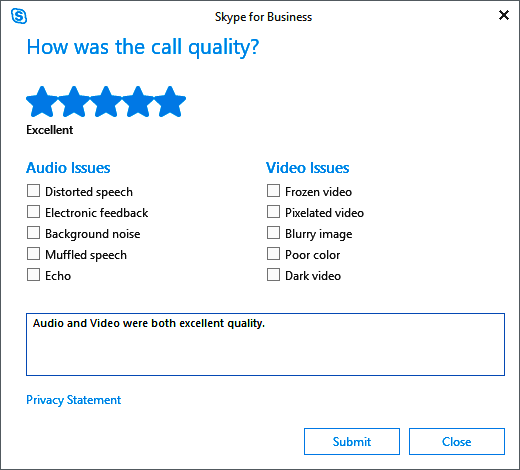 Another example of a product that provides great customer service is Skype. 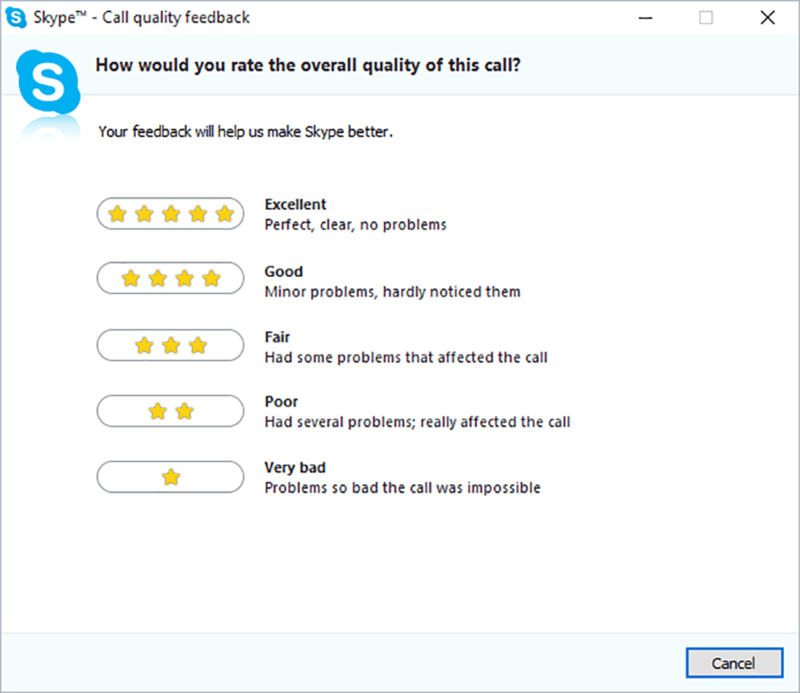 If you call people often using Skype, you know that it asks for feedback after every call. But more than that, it believes in immediately solving customers' problems. In one instance, Skype left a customer overwhelmed by its quick response time. Amazon seems to be exceeding user expectations by collecting all kinds of information and making these easily accessible such that users can find the answers themselves in a knowledge base to provide customers with self-service support. This reduces the chances of incorrect purchases, which can make all the difference in a customer's buying decisions. Not only is Twitter great for direct (personal) and public messages, it's working toward bridging the communication gap between brands and viewers. 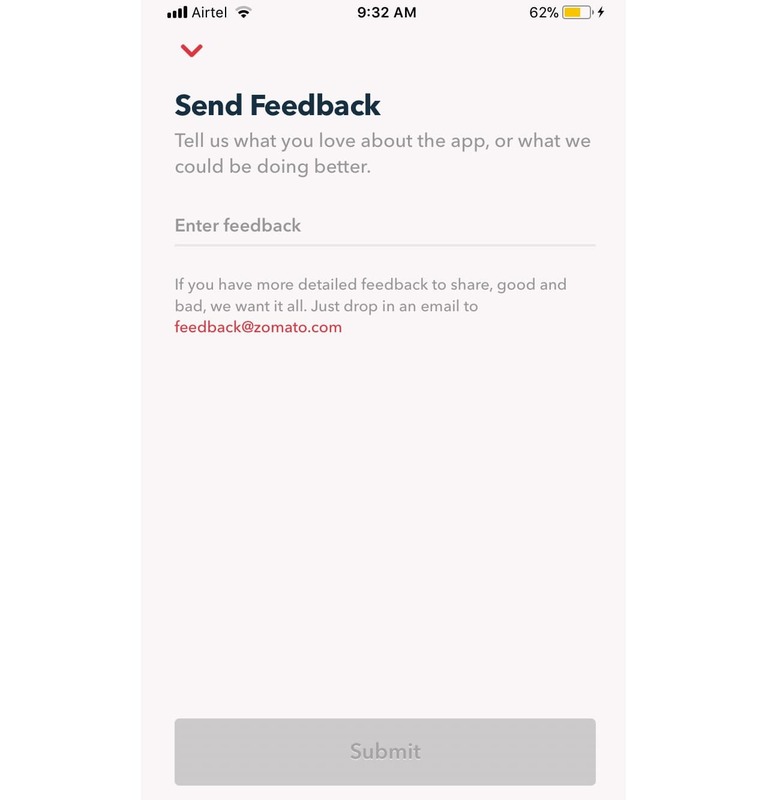 It came out with "Surveys" as a feature, which allows businesses to ask for customer feedback after a Twitter conversation by deploying NPS and customer satisfaction surveys. Another product with two types of customers -- restaurants and hungry diners -- Zomato puts both of their needs and expectations into consideration. Every restaurant gets rated on the food, and every buyer of food prefers restaurants with better ratings. For that reason, in 2016, Zomato suddenly deleted an account when they found out that he was offering positive reviews as a paid service to restaurants. 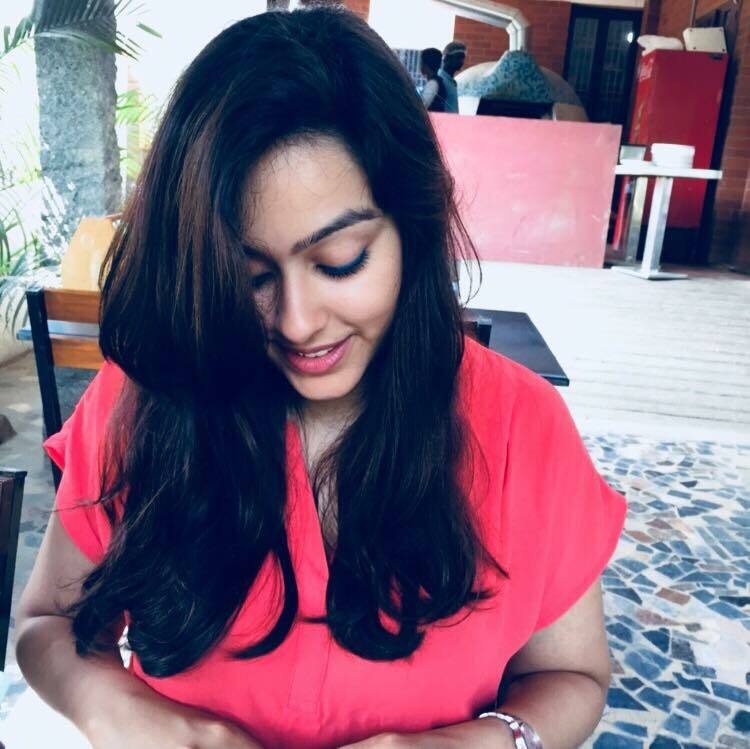 Zomato won the Internet by slamming this user on social media, demonstrating that it clearly takes its customer experience seriously. 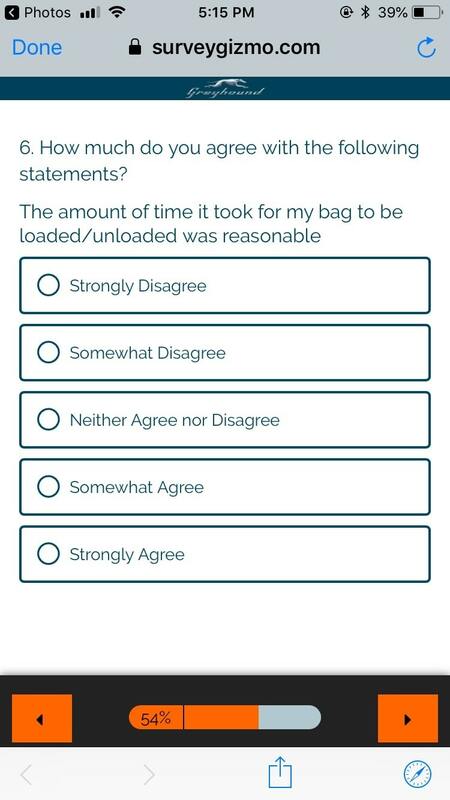 Here's a great example of a customer satisfaction survey from Greyhound that measures the qualitative sentiment and experience about interacting with and buying from a brand. In such a crowded space as bus lines, Greyhound needs to make sure that the service it's providing works for its customers -- or else, they'll start losing them to competitors. 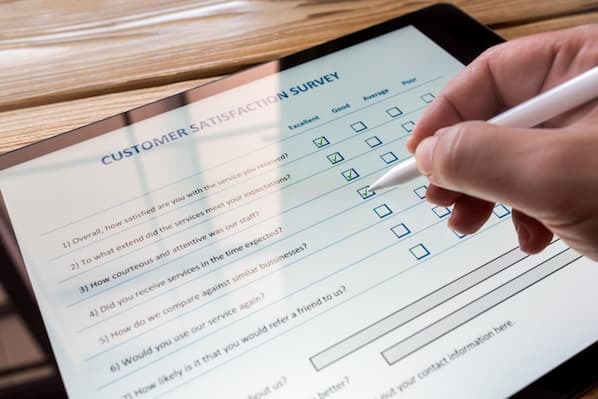 This customer satisfaction survey, deployed immediately after a trip, is a great way to measure customer satisfaction in the moment when it's most memorable for a customer. H&R Block Advisors sent another well-timed customer satisfaction survey -- just after "Tax Season" in the U.S.
For accountants and financial advisors, the period of time before the tax filing deadline are its busiest months, so a prompt survey after filing with Block helps the company gauge how many returning customers it can expect. Measuring sentiment, in addition to satisfaction, is an important question to ask your customers. 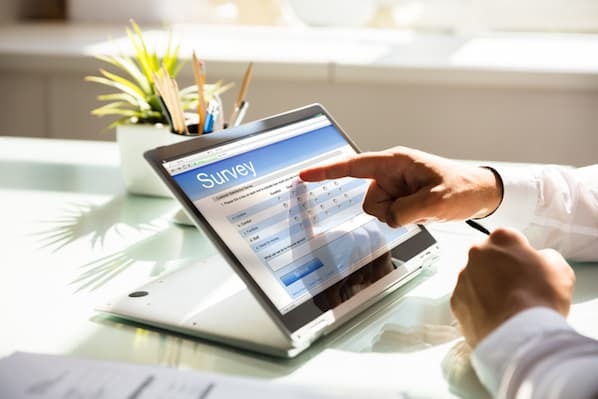 In this survey, GEICO asked about customer sentiment regarding a specific interaction during the purchase process, as well as the general sentiment about the experience overall. In this way, GEICO is able to smooth out specific roadblocks over the course of the customer journey, as well as get an in-the-moment snapshot of its wider customer sentiment. HubSpot is another company that uses NPS to assess customer satisfaction. This score primarily comes into play with their customer support and success teams who can be reviewed after each new interaction. HubSpot's engineers then use these responses to address areas in their software that could use improvement. By using this scoring system, HubSpot is able to attain both qualitative and quantitative data that directs their product development teams. Taco Bell has made an outstanding commitment to gathering customer satisfaction feedback. Every receipt is printed with survey instructions that are placed in locations that are easily noticed. 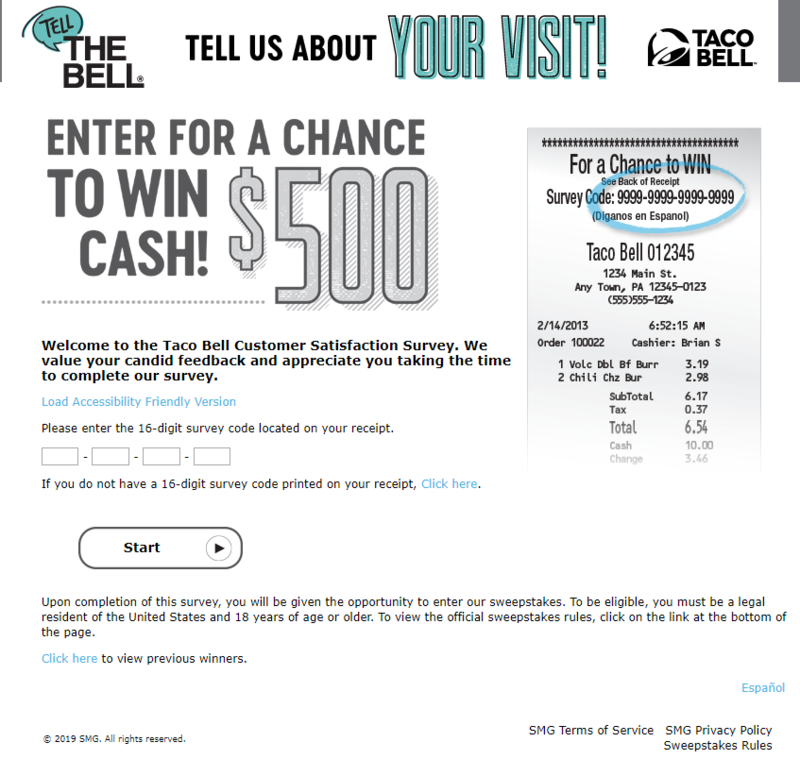 Taco Bell also incentivizes its customers by offering them rewards for filling out surveys as well as entering the participants into a sweepstakes upon survey completion. Make sure you choose the right customer feedback survey tool. Always ask short and relevant survey questions. Give a lot of thought to the placement of your surveys over the course of the customer journey. Always A/B test your surveys. Thank your customers for their feedback, regardless of the nature of the feedback. Next, read more about how to design your own customer satisfaction survey.